Ever since I discovered how easy it is to make your own stocks at home, I have been hooked! In addition to being easy to make, the homemade versions pack in more flavour than the store bought ones and better yet, you control exactly what goes into them. 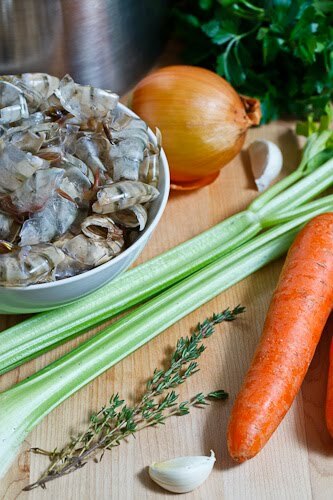 Although I tend to make chicken stock the most frequently, I also enjoy making shrimp stock for use in shrimp based soups and all that is really required is that you save the shells and heads until you have enough to make some stock. The shells and heads will store well in the freezer until you have enough of them so it only really costs you a bit of freezer space. One of the nice things about stock recipes is that you can play around with them and if you know what you are going to be using the stock in ahead of time you can tailor the recipe to suit. This is a pretty standard version of the recipe where I start with the classics of onion, celery, carrots, garlic, parsley, bay leaves, salt and pepper. Since the dish that I was planning to use the shrimp stock in contained thyme, I threw some into the stock as well. Stocks generally need a lot of simmering time to draw out all of the flavours and although shrimp stock does not absolutely require as much time, I like to simmer it for a while to let the stock reduce a bit and concentrate those flavours. Once the stock is made it will keep for a few days in the fridge so you can make it ahead of time or you can store it in the freezer for longer periods of time. Bring everything to a boil in a large stock pot, reduce the heat and simmer for 1-3 hours. Strain the solids from the stock and let cool. Store in fridge for up to 3 days or in the freezer for up to a month. Never used shrimp stock in any recipes, looks like quite lots of work to get the shells and head of shrimps, but I'm sure that the end result is worth it. Nice recipe! I can imagine so many things I would do with this! Yum! I made shrimp stock a while ago and I could have lapped up the entire pot. I had to restrain myself to save it for the risotto. Do you think this recipe would work with just the shrimp shells? I use headless shrimp. Thank you for this! We've been wondering what is the best way to make it. Now we have an idea! Regan: Yes you can do it with just the shells but you should use more shells in that case, say the shells from 3-4 pounds of shrimp.